SAN FRANCISCO--(BUSINESS WIRE)--After years of anticipation and speculation, today the public art installation that will top Boston Properties and Hines’ new Salesforce Tower was finally revealed. 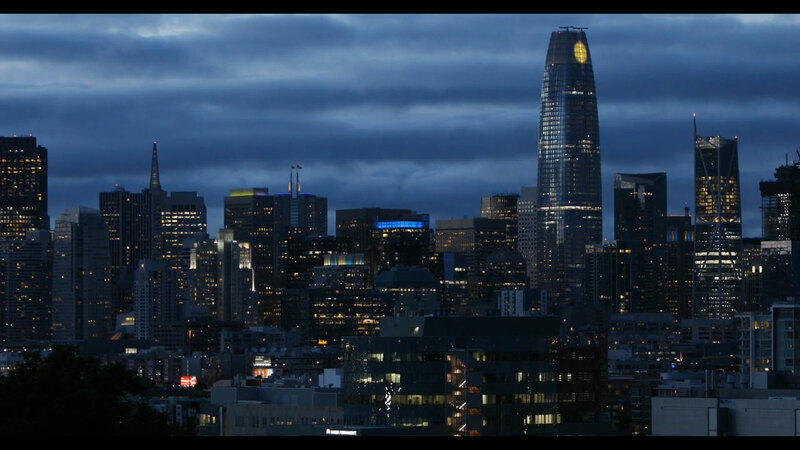 Local artist Jim Campbell has created a piece called “Day for Night” that will be the tallest public art installation in the United States and forever transform the San Francisco skyline. The piece is meant to be an integrated part of the community, as cameras throughout the city will capture daily activity and play scenes back at night on top of the tower. Over its lifespan, the piece will chronicle the city and be an ever-evolving fixture of the community. Campbell started his career as an MIT-educated engineer. He worked in Silicon Valley on high-resolution screens and televisions. In his spare time, he began making art in his Potrero Hill garage. He began using LEDs as a primary medium in 2000. His custom electronic sculptures and installations have made him one of the world’s leading figures in the use of computer technology as an art form. 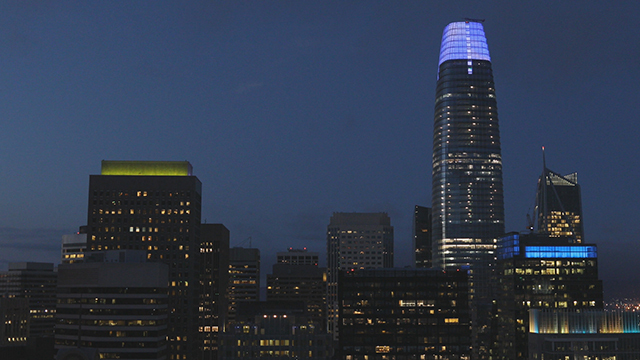 At 1,070 feet, the Salesforce Tower will be the tallest building on the US West Coast. “Day for Night” will be visible for approximately 20 miles around the Bay Area. The exterior of the top six floors will be softly lit with 11,000 LEDs, together capable of displaying low resolution moving color imagery and will only require the energy equivalent of five toaster ovens. The content for the light installation will be ever changing. Because the piece is part of the San Francisco Art Commission’s commitment to public art, the installation will never project advertising or messages, but is an exclusive medium for Jim Campbell’s artistry. Jim Campbell’s art, which has been shown in major museums across the globe and whose public commissions include a 1,000 foot-long ceiling sculpture at the San Diego Airport, can currently be seen at the San Francisco Museum of Modern Art and at Hosfelt Gallery in San Francisco. The gallery will present a solo exhibition of Campbell’s work in September of 2019 and private viewings of his artworks can be arranged by calling 415-495-5454. The gallery is open Tuesday, Wednesday, Friday and Saturday 10 am-5:30 pm, and Thursday 11 am-7 pm. For more information, including photos and a description of Jim Campbell’s work, visit www.hosfeltgallery.com. Founded 20 years ago in September of 1996, Hosfelt Gallery has been a pioneer in the San Francisco and global art scene, representing contemporary artists from around the world. Hosfelt Gallery has represented Jim Campbell and his work since 2001. For information on current and upcoming exhibitions and artists represented, visit www.hosfeltgallery.com.